Around 30 million Americans have accounts that are in collection. This means 30 million Americans are dealing with phone calls, letters, and even home visits from debt collection agencies, adding an immeasurable amount of stress to their lives and putting them under immense pressure to make the necessary repayments. However, there is a fine line between legally reclaiming money that is owed and resorting to illegal, pressurizing tactics. Sometimes debt collectors cross this line and employ aggressive or underhanded strategies in their pursuit of the debt. 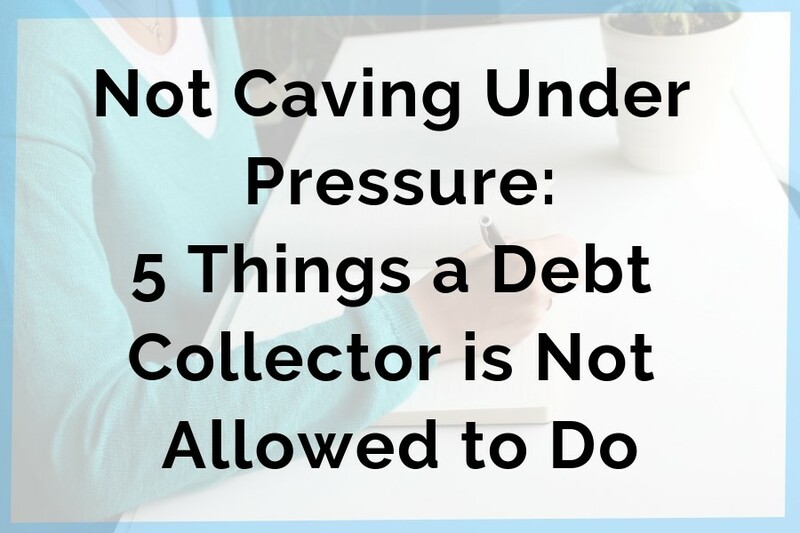 Here are five things that a debt collector is not allowed to do under any circumstance. A debt collector cannot lie to the borrower. Sometimes overzealous collectors tell borrowers that they will be arrested if they don’t make a payment or inform them that they are about to phone the police. This is a lie designed to force repayment. The police cannot be called to arrest you for not making a debt repayment. An incident in Georgia in 2014 demonstrated the lengths debt collectors will go to in order to pressure borrowers into making payments. The owner and employees of a debt collection agency told borrowers they were working for the Department of Justice and in some cases, pretended to be US Marshals to get borrowers to pay up. This is illegal. Debt collectors cannot misrepresent themselves as any form of law enforcement or government service. Debt collectors are not allowed to show up at your workplace demanding payments. This would be considered as publicizing your debt, which is prohibited under law. They are permitted to call you at work, but in this instance, they cannot reveal to your work colleagues that they are debt collectors. If you ask them not to contact you at your workplace, they must stop calling you at work. Failure to do so puts them in breach of their legal requirements and makes the debt collection agency vulnerable to penal measures. Debt collectors are not permitted to make threats of violence or legal proceedings against borrowers. If they are actually filing a legal lawsuit, they can inform the borrower of the pending case, but they cannot threaten to file a lawsuit. There are strict laws governing when a debt collection agency can and cannot contact you. They may call or visit you at any time between 8 am and 9 pm. If a debt collector calls you outside of these business hours, they are breaking law, however, your debt obligation will remain. If a debt collector attempts to extract money from you or pressure you into making payments through the use of these measures, they are breaking the law. They are allowed to apply pressure and there are no limits on the number of times a debt collector can contact you, but these are legal red lines and cannot be crossed. If you are struggling with debt collectors, National Debt Relief has info on consolidating your debt and reducing your monthly debt repayments. PreviousLending 101: How Are Interest Rates Calculated?